The gates at Key Largo’s Ocean Reef Club might as well be a portal into another world. A fairly mundane drive through the mangroves on State Route 905 quickly transforms into perfectly manicured gardens, palm trees, and a fleet of golf carts as soon as the security guard gives you the all clear. The 70-year-old private community sprawls out over 2,500 acres, complete with a marina, tennis court, spa, and fitness center. Residents can fly in on the private airstrip, stay in luxe homes, eat in the town village, soak up the sunshine, road trip to Miami—and leave whenever the timing feels right. For all the benefits and privileges of a community like Ocean Reef Club, though, the average resident age of 55 can sometimes create a more buttoned-up environment. After two years wooing Ocean Reef leadership, Soulavy received the green light in 2014 to purchase the aging Marina Inn on the parcel. He broke ground on a 27-unit complex in September 2016; full delivery will happen by September 1 of this year. The complex is split up into nine series all overlooking the canal, with private boat dockage separate from the other areas within Ocean Reef. It’s certainly a striking difference from the other condominiums—and even the standalone homes—nearby. Its lines are sharper, exposed materials richer, and inviting layouts more modern, all designed to open the doors to a younger yet equally affluent demographic. “It’s easy, comfortable living with amenities appealing to buyers looking for privacy and [dedicated staff] for a smaller number of units,” Soulavy says. It’s also posh, even by Ocean Reef standards. Nine-foot ceilings greet owners as they stroll into very modern kitchens complete with Mia Cucina cabinetry and pro-grade appliances. Depending on the unit, large terraces and prime outdoor spaces are included. Select interiors were designed exclusively with name-brand designers including Ralph Lauren Home and Bottega Veneta Home Collection. Amenities are also top-line. In addition to everything on the grounds as part of an equity membership, 121 Marina has its own garage with electric vehicle charging stations at each parking space (a nod to the younger buyer) and its own fitness center, putting green, and yoga lawn. Soulavy also took steps to secure the waterfront acreage after last year’s active hurricane season. His team built a new 450-foot seawall along the frontage and improved the existing boat slips (10 in all). 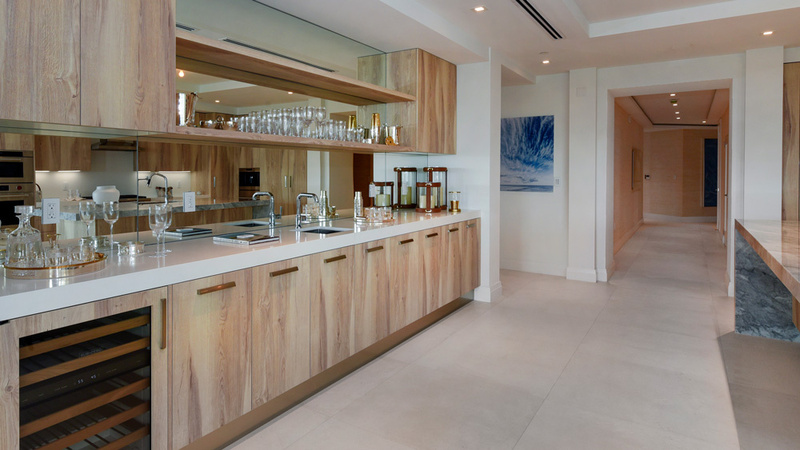 It’s by far one of the freshest and safest buildings in Ocean Reef Club. By all accounts, 121 Marina has been a success, even pre-official opening. Fifteen units have been sold, and 12 remain at an average price of $5 million. They range from a standard four-bedroom to a larger double unit.